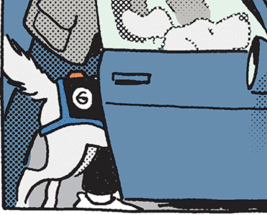 Today’s strip is about as inoffensive as Funky Winkerbean gets. In fact, if you weren’t familiar with this strip and its characters, you could conceivably enjoy this. Such is the trouble with reading this strip regularly, we know these characters and we know the tone the strip usually takes. We are generally given little reason to like either. Instead of finding this sweet, as Holly does, we are contemplating how out of character it seems for both of them. We are left wondering if Funky is really paying her much of a compliment as the only chocolate available in Westview is probably Dinkle’s awful band candy. We are pondering where this affection was when these two were disagreeable or despondent as they pretty much always have been in the recent past. That said, we also know the depths that this strip can plumb. Thus, I probably shouldn’t protest too much. I’ve already gone on record admitting I usually like the way Batiuk draws couples kissing. So I think today’s panel 2 is sorta cute, even if Funky looks like Mister Magoo. And, probably by coincidence, Batty has depicted the current lunar phase! The text content, though…meh. The Winkerbeans have settled in for the night when Holly offhandedly mentions a couple things she’d forgotten to tell him. The “check engine” light, that bane of motorists’ peace of mind since the late 20th century. Usually not as serious as other dashboard indicators such as, say, the brake light. Probably 75% of the time it’s just letting you know it’s time for an oil change. On one of my cars, I ignored the “check engine” light until it burned out–problem solved! And the expiration date of Holly’s driver’s license is somehow tied to Funky’s? Do they do their motor vehicle business together like they do their annual physical? In either case, both issues can be addressed in the morning and are nothing over which to lose sleep, or shouldn’t be to a man who’s struggled to keep a business afloat, dealt with an aging parent, or had a kid serving overseas in the military.